We welcome golfers with disabilities. 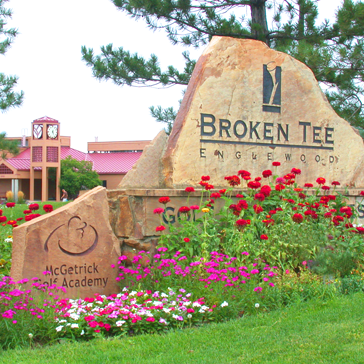 Broken Tee Golf Course does have the use of specially equipped golf carts for people with disabilities. These golf carts are available on a first come first serve basis as we have a limited number. This offering is courtesy of the Golf for the Disabled organization. Please call 303-762-2670 to inquire about availability. Golf for the Disabled also has lessons available at Broken Tee Golf Course. Please visit www.golf4thedisabled.org for more information. Tee Times - Englewood Residents with a valid recreation card may book times 9 days in advance, starting at 2 pm. Non-Residents, 40th Anniversary Pass Holders and Guests may book 8 days in advance, starting at 2pm. No advanced tee times for Quick 6 reservations. Same day reservations only. Please call the Pro Shop at 303.762.2670 for same day reservations. Multiple Consecutive Tee Times - For more than 1 tee time, call the Pro Shop to reserve times. Credit card information will be required to reserve the multiple times. If 3-5 tee times needed, a deposit and tournament agreement will be required. Credit Cards - Credit card number is required to guarantee the reservation only if reserving a tee time as a Guest online. The credit card will not be charged UNLESS the reservation is not cancelled or modified at least 24 hours in advance. At this time, credit card numbers will not be required for those signing in using their username and password. If it is found that there is a pattern of No-Shows with account holders, this policy may be changed. If No-Show one time, there will be a warning. If there is a second No-Show, your account will not be allowed to reserve tee times online. Cancellation Policy - Please cancel or modify your tee time no later than 24 hours in advance to avoid charges to your credit card for the number of players failing to cancel by calling the Pro Shop at 303.762.2670.